The start of a new year always brings new opportunities and renewed optimism about the year ahead. As I traveled around Australia late in 2017, most customers were very excited about the opportunities available in 2018. And, we are excited about 2018 too. This year, 2018, is a special year for our company — we are celebrating 21 years of partnering in Australia! It has been a great honour to play a small part in our customers’ successes over the past 21 years, and on behalf of all Genie® team members, I would like to thank all our customers for choosing Genie as their access solutions provider in Australia. Back in 1997, we started with one team member, and a small warehouse in Brisbane, and now we have six warehouses and over 100 team members nationally serving customers every day. On Tuesday 29th of May, we will be celebrating the 21-year journey with our customer appreciation event as part of the HIRE 2018 show week, and I look forward to seeing all our customers at the celebration. What else is happening in 2018? Being an American subsidiary, Genie Australia has just completed its financial year, and by all accounts, it was a good year. The highlight in my mind was the launch of the new Genie Z®-60/37 FE hybrid articulating boom. This machine has been very popular with customers because it replaces the need to have two machines as it can be used both inside and outside. For outdoors, it has true rough terrain capability with AC drive motors and RT tyres, and indoors, you can switch to all electric use and non-marking tyres for slab work. Hybrid machines are the future, and the Genie Z-60/37 FE model is just the tip of the iceberg for our company’s new product development. Coming in 2018, and beyond, we will be adding more models to the Genie Xtra Capacity™ fleet. The next new model you will see will be the Genie S®-85 XC™ telescopic boom, which will be launched at the HIRE 2018 in May. Feedback from customers over recent years has directed our engineering efforts toward allowing for more people and equipment in the platform, and the new Genie S- 85 XC boom provides the solution with a platform capacity of 450 kg, enough for an extra person and more equipment and materials. In 2019, the same technology will be available in the Genie S-65 XC and Genie Z-45 XC models. In 2018, we will also be upping our game and finding better and quicker solutions for our customers. Earning your business each and every day is our priority. To this end, we are adding resources in all our key businesses: Service, Parts and Pre-delivery, and we also boosted our sales team in early January with the addition of Mike Podziewski. Mike will be serving our local Sydney, regional New South Wales and New Zealand customers so you get what you need. Welcome aboard Mike! Podziewski takes on new sales manager role for regional NSW and New Zealand Sales Manager; Pettit fills Retail/Inside Sales Coordinator Role. 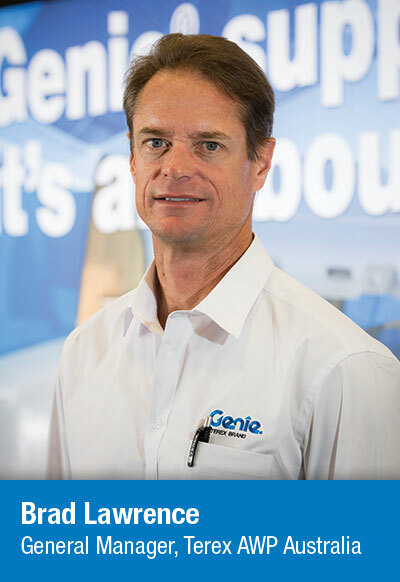 Mike has a strong history with Genie® products from his previous role as a Genie sales specialist with our New Zealand partner Youngman Richardson & Co Ltd. “His experience and extensive knowledge of the Genie product will be a valuable resource to our customer base and an extremely valuable asset to our sales team,” said Kurt Kinder, Genie National Sales Manager, Terex Australia. Amy has been appointed as our new Retail/Inside Sales Coordinator. “Amy’s in-depth knowledge of our products and her attention to detail will ensure that our retail resellers and customers will be well looked after,” noted Kurt.